dual helm positions with stairs to access the fly. 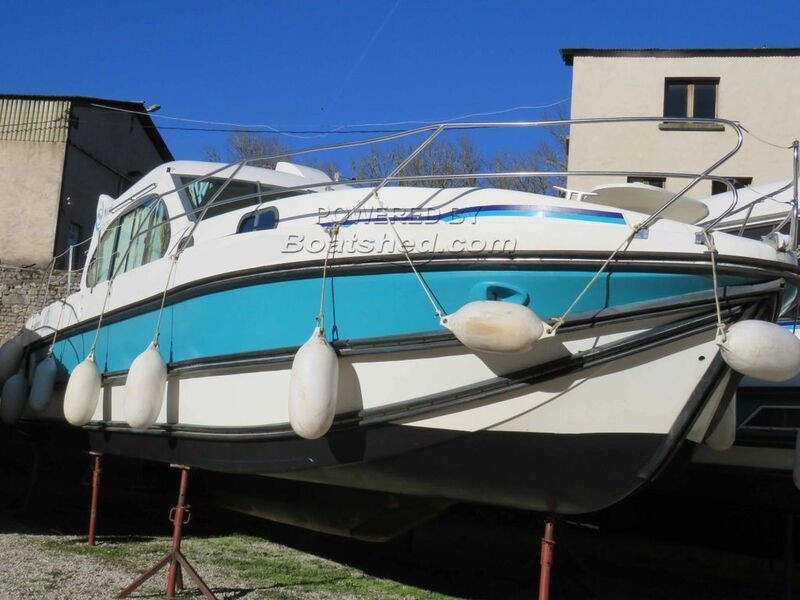 Ex hire boat canal and river cruiser for sale in France. We are pleased to offer this Nicols SEDAN QUATTRO for sale. Nicols are renowned for combining innovative design and quality construction. With quality trim and equipment the SEDAN range make ideal boats for refined personal use. Ease of movement, ease of maintenance. Outside space on the fly or foredeck with a table and seats moulded in the hull. Free mooring in the LOT valley for 2019 & free crane out for transport to other waterways if desired. We have negotiated a special price of just 1000€ for road transport to Midi Canals mainline canal including relaunch. Enjoy the fabulous Lot navigation this year and the rest of Europe the next. Ideal boat for a family or 2 couple with confort. The 2 connecters for the unique Piscinette are available. For further information and appointments to view, please contact Magali WHARMBY your broker at Boatshed Midi Canals. These boat details are subject to contract. Note: Offers on the asking price may be considered. This Nicols Estivale Quattro Double Helm Positions has been personally photographed and viewed by Magali WHARMBY of Boatshed Midi Canals. Click here for contact details. Please note this comments section is public. Please do not post your personal details here. To enquire about purchasing this boat, please contact the broker directly at boats@boatshedmidicanals.com. Please read our commenting guidelines before posting.